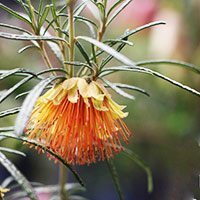 Not widely grown, Diplolaena species deserve a little more recognition from gardeners and landscapers alike. Diplolaena grandiflora is but one of a number of garden worthy species that are now offered by specialist native plant nurseries.. 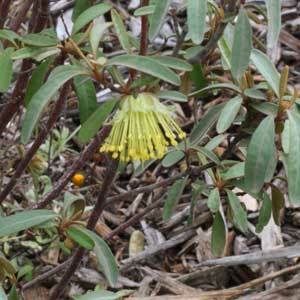 This is very attractive genus and most Diplolaena are a fascinating plants from Western Australia. Sometimes called the ‘Native Rose’ or ‘Western rose’ they are distinguished by the long stamens of the small flowers that form in groups to create larger clusters. It is the more compact cultivars that are best suited to the home garden, they make excellent feature plants in the garden border. All species require a well drained position with sun to semi shade, they prefer a climate that does not experience humid conditions as this encourages fungal disease. All species grow best in full sun to light shade. Mulch around plants to maintain some moisture and a cool root run. Use a low phosphorous slow release type fertiliser formulated for native plants. Tip pruning from an early stage will encourage good bushy growth. Grafted Diplolaena are now becoming available, these perform much more satisfactorily in the home garden. With these forms watch for any growth below the graft and remove it.